Both T.38 and Fax over G.711 codec are supported. 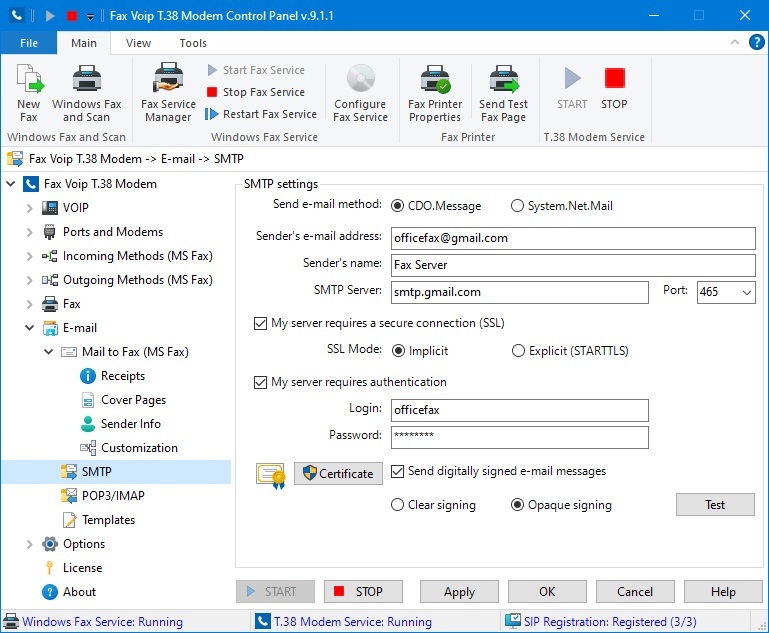 Flexible settings allow you to send and receive faxes using many SIP/H.323 telephony services over the world. Fax Voip is easily integrated into the telephone network of your company. 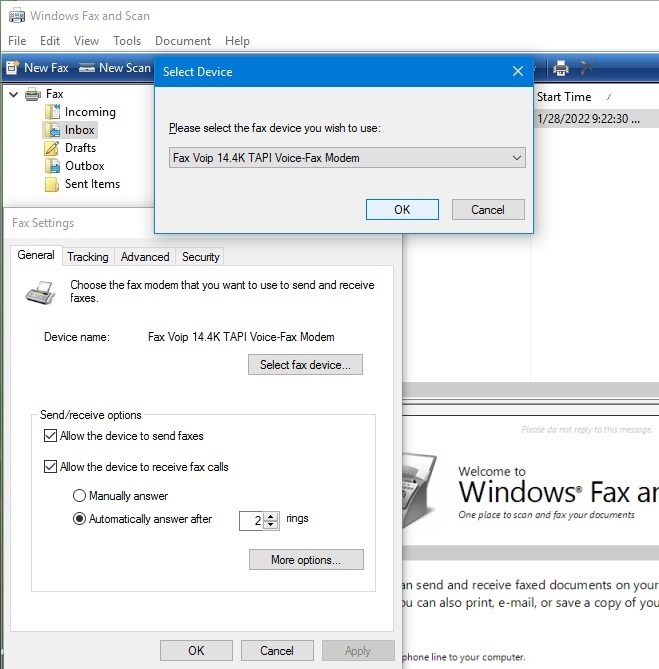 Use Microsoft Fax or any other standard fax-voice software to send or receive faxes and audio messages via VoIP. Replace your hardware modem by the new Virtual COM Ports (voice modems) that Fax Voip installs into your system. 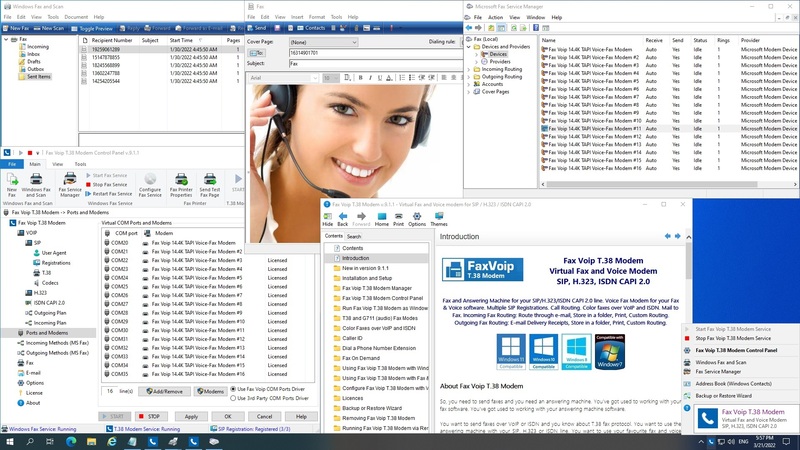 Use Fax Voip Console to manage your outgoing and incoming faxes. 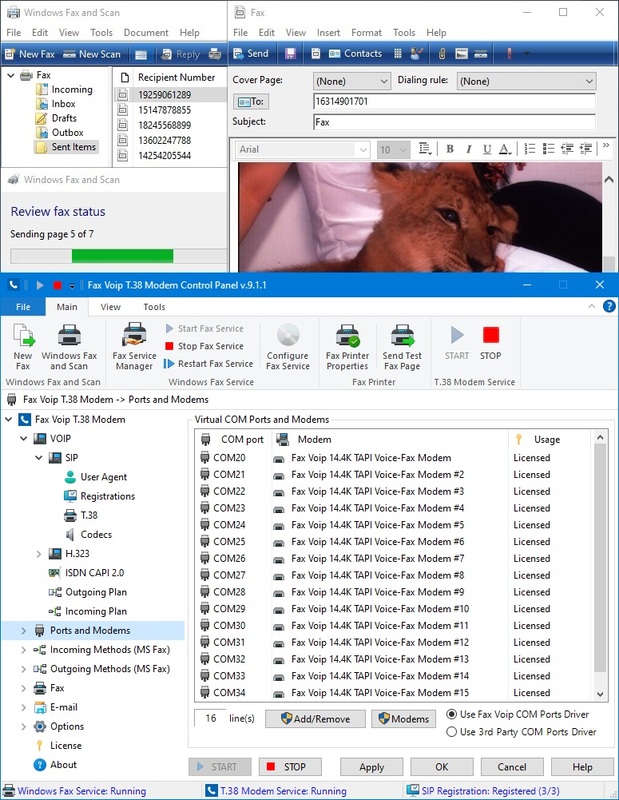 Using Fax Voip Virtual Printer you can send a fax from any Windows application. Send and receive faxes and audio messages via so-called Fax Voip Built-in Lines. 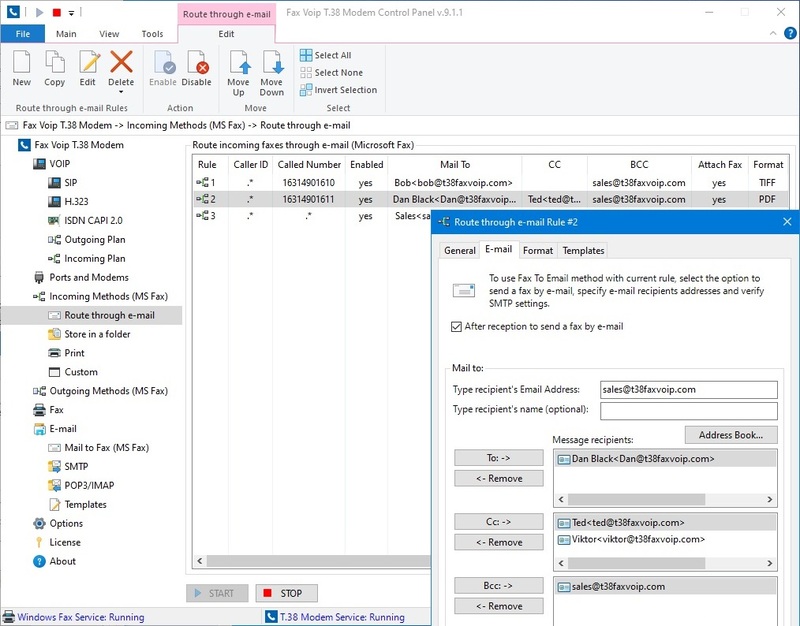 Send your faxes and audio messages from any e-mail program. 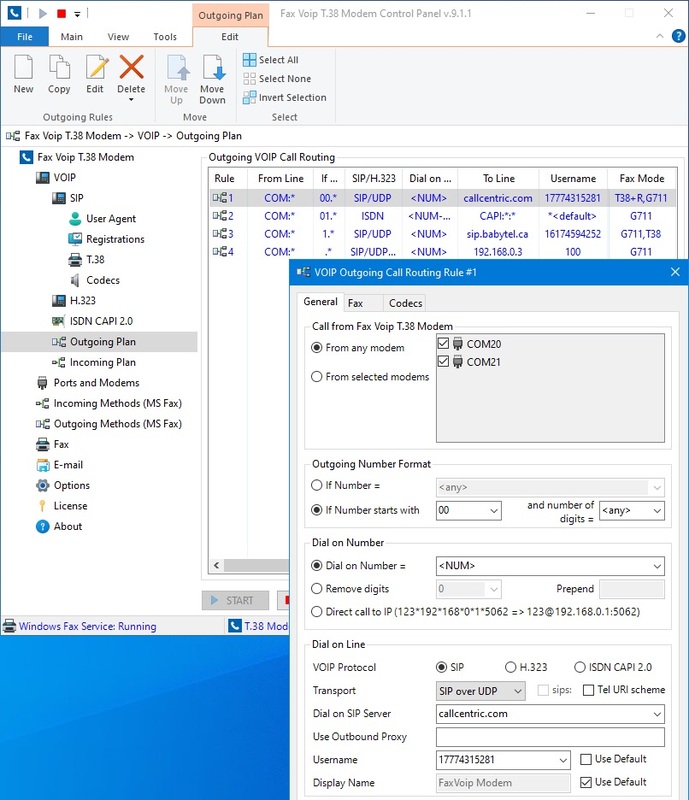 Route incoming faxes using Fax Voip Incoming Routing methods (Route through e-mail, Store in a folder, Print). Session Initiation Protocol (SIP) is the most commonly used VoIP signalling protocol. 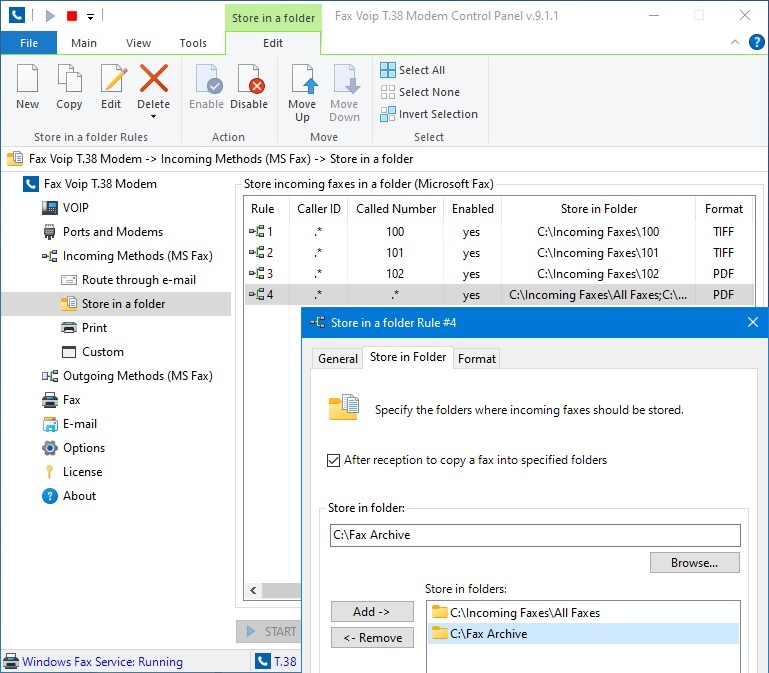 Fax Voip can be configured as standard SIP client. 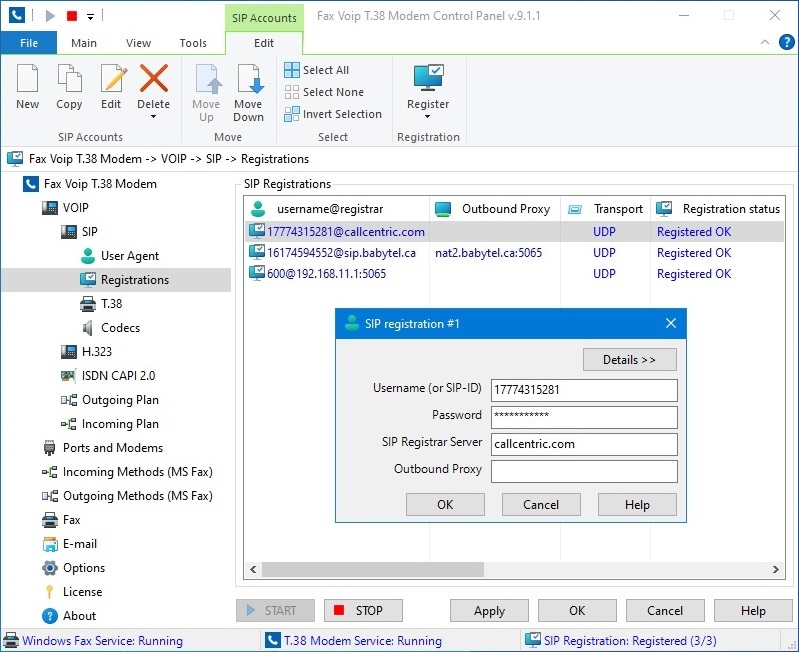 Multiple SIP registrations are supported. H.323 is one of the standards used in VoIP. 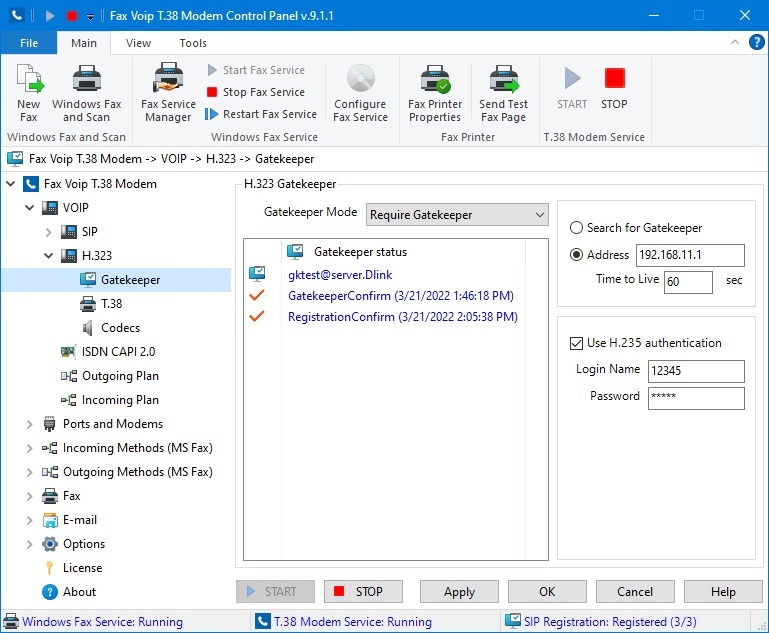 Fax Voip is able to operate as independent H.323 endpoint or can register with H.323 gatekeeper (GK). 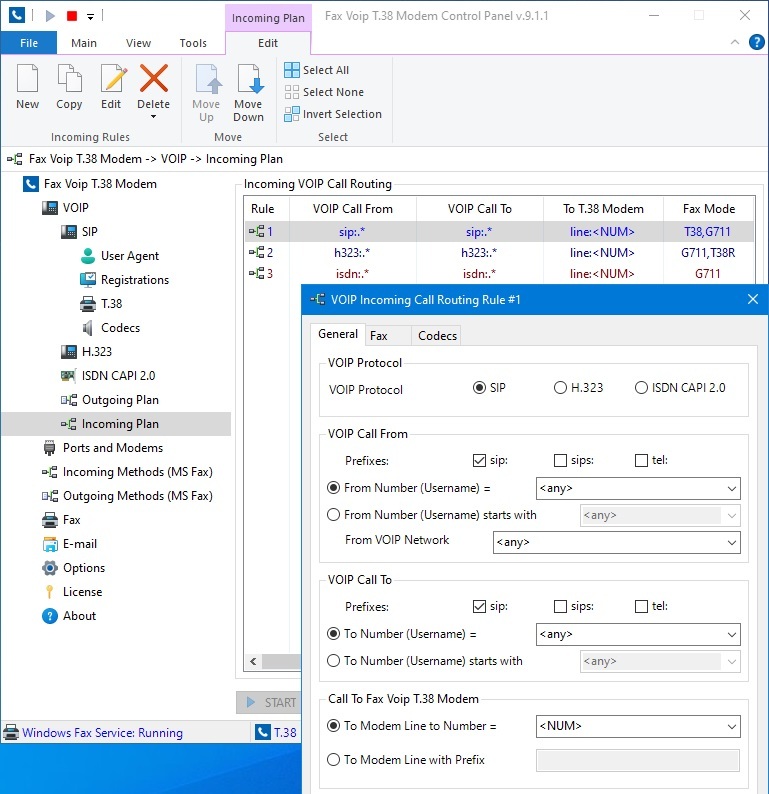 CAPI 2.0 is an application programming interface standard used to access ISDN equipment. 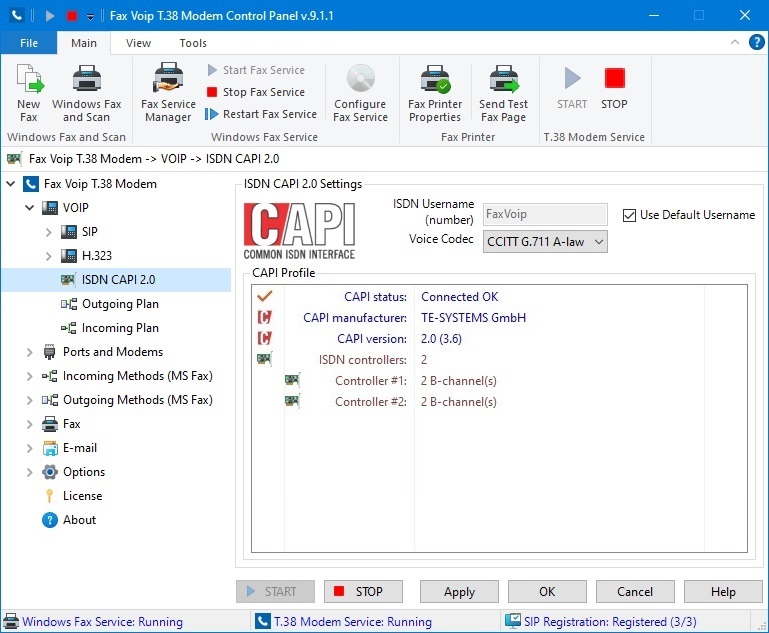 CAPI 2.0 driver is supplied by the manufacturer of your ISDN card. T.38 - the most reliable standard used to transmit faxes over VoIP in real time. Isolates from the delays, timing jitter, and packet loss experienced in VoIP networks. Transmitting a fax over voice codec. Can be used with VoIP providers that don't support T.38 but provide good-quality voice channel. 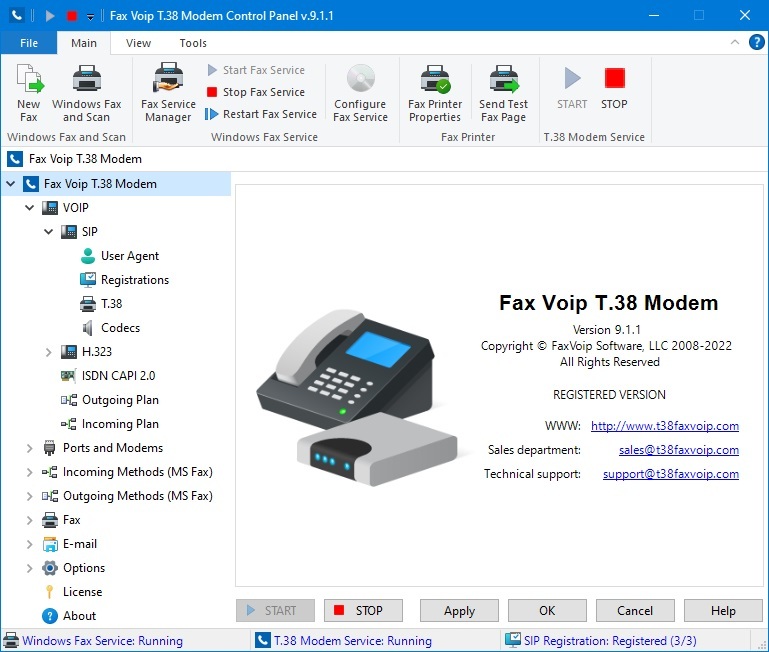 Voice Modem functionality allows to use Fax Voip with voice modem software (e.g. answering machine). Also you can send audio messages via built-in lines. 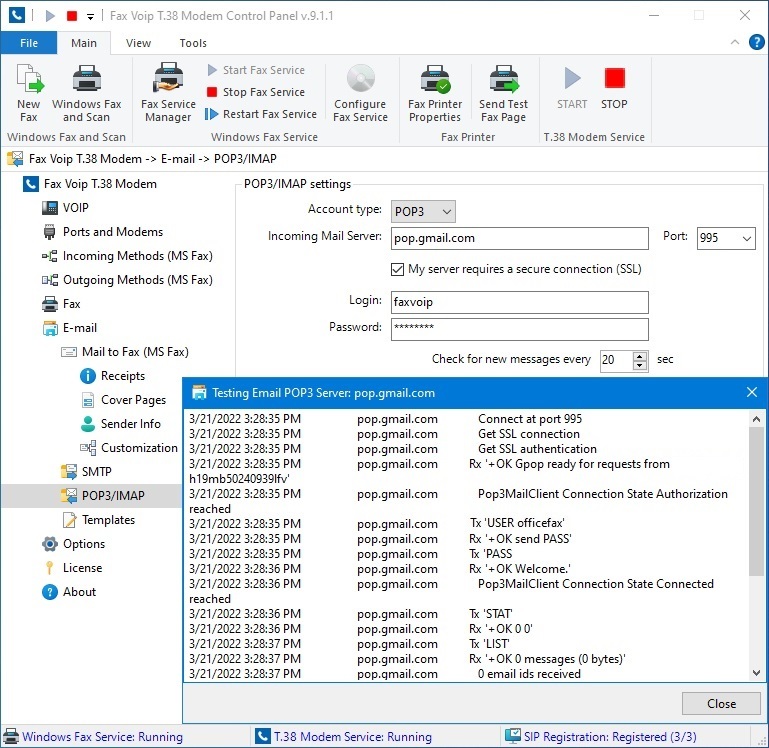 Virtual Serial Port interface allows standard fax or voice software to communicate with Fax Voip. It is a bridge between your fax or voice software and VoIP. 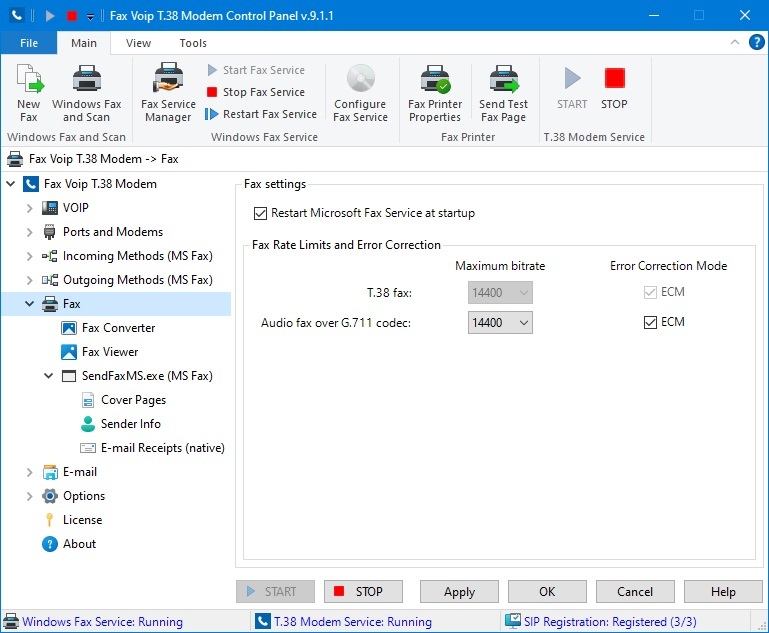 Fax Voip 14.4K TAPI Voice-Fax Modem driver is reguired for TAPI compatible standard fax and voice applications (e.g. Microsoft Fax). 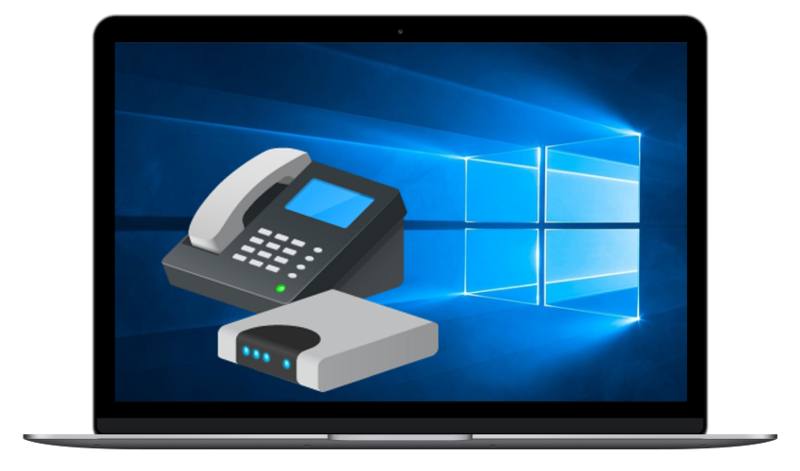 So called Fax Voip Built-in VOIP/ISDN Fax/Audio lines allow you to send or receive faxes and audio messages using Fax Voip Console application. 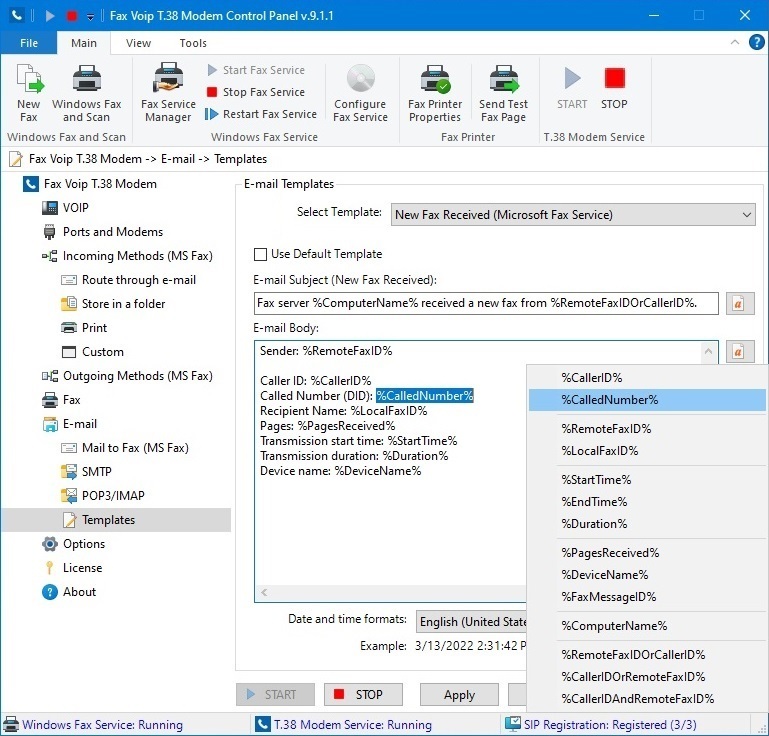 Using Fax Voip Virtual Printer, you can create a fax from any Windows application. Some file formats (PDF, TIFF, JPEG) can be converted into fax directly. 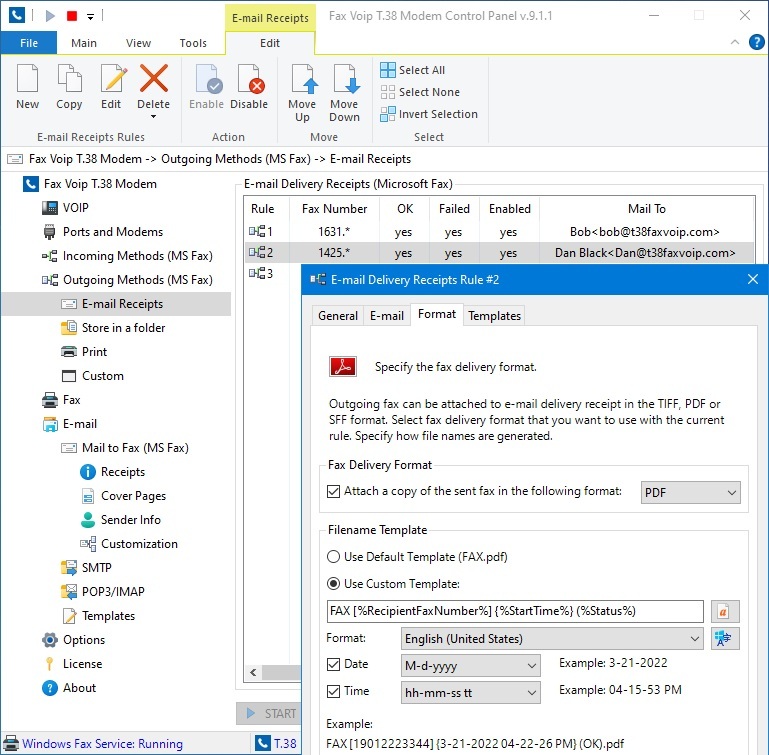 E-mail to Fax and E-mail to Audio. Fax to E-mail. Customizable Email Templates. SMTP, POP3/IMAP, SSL. Digitally signed e-mail messages. Incoming Routing Methods used to route incoming faxes to recipients on the network. The fax can be delivered via e-mail, copied to folder or printed. I spent a lot of time trying to get faxes to work and I finally had success by using Fax Voip. It essentially creates virtual sip modems that allow you to fax from the MS Fax server to the 3CX. Fax Voip is connected to our SIP provider and sends out the Mails as T.38 Fax over SIP Trunk. Was also able to send out G.711 Faxes over our ISDN Line. This is a simply fantastic effort ! I am very happy with Fax Voip. It has many nice features which similar software does not have. I tried many of these and settled on yours as the best!